Acrylic nails will always hold a place in my heart. But press on nails fit right into my budget and schedule. All while keeping my nails slayed! This set from Claire’s is an affordable $8.99. It comes with 24 nails, nails adhesive and a mini cuticle stick. The Kiss Gel Fantasy Press On Nails are still a huge fave of mine. However, Claire’s is really killing the game with the length! 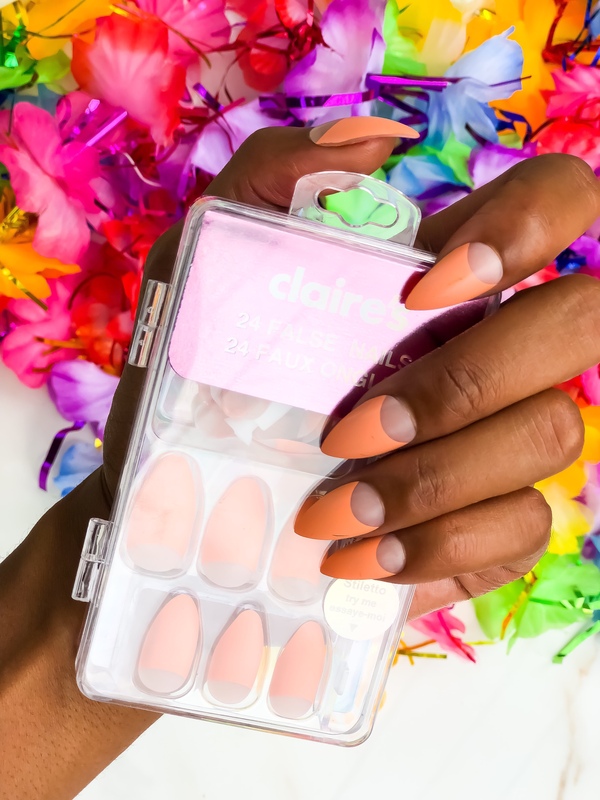 I prefer longer nails so the Claire’s stiletto and coffin press on sets are right up my alley. The key to a natural looking set is to file them. For this look, I used a file at home at to sharpen the edges and better taper them to my fingers. I’m really pleased with the result! I just wish the paint was better quality. It chips quite easily. If you decide to try this set you may want to try topping it with a clear coat.